This is a 3 ft. long stereo camcorder A/V cable. This cable is used to connect your camcorder to your TV or VCR for video and stereo audio playback. 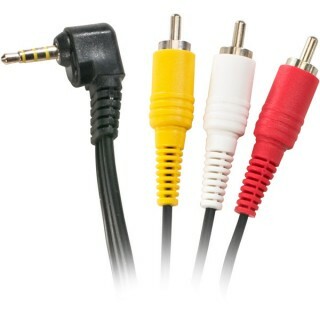 One end of the cable has a 3.5mm (1/8") right angle 4-pole mini plug which plugs into your camcorder's mini AV jack, and the other end has three color coded RCA plugs (video and L+R audio) which plug into the RCA input jacks on your TV or VCR. It is compatible with most MiniDV and Digital8 camcorders made by Sony, Canon, JVC, Samsung, Panasonic and Sharp. It also works with many Hi8 camcorders and Sony Cybershot/Mavica digital cameras, although most are only capable of outputting monaural audio.